Verne Cahan, my Aunt Aileen’s husband, was a mystery to me. I was very young and shy so I kept my distance. When he married Aileen he already had two children and so it may have been why Aileen and Verne did not have any children of their own. I was told he was in the thick of the fighting in WWI and that sort of changes a man. He had a son and daughter from a previous marriage. I knew his son Mel but don’t have much memory of his daughter. I write this post to honor Verne for he was a Mason and he was my sponsor for when I wanted to enter into the International Order of the Rainbow for Girls in the early 1960’s. Thank you Verne. Carroll Verne Cahan was born 17 February 1897 in Tekoa, Whitman Co., Washington. His father was Frank M. Cahan born December 1858 in Illinois and died before 1920 in Washington. His mother was Lola Fenn born February 1873 in Utah. Mrs. Lola Cahan is mentioned in the newspaper wedding announcement for Verne and Aileen so this means she was living in 1938. The following picture was among Aileen’s photographs. I recognize Verne, who is standing on the far left, but the others I do not know. I am guessing they are his brothers? 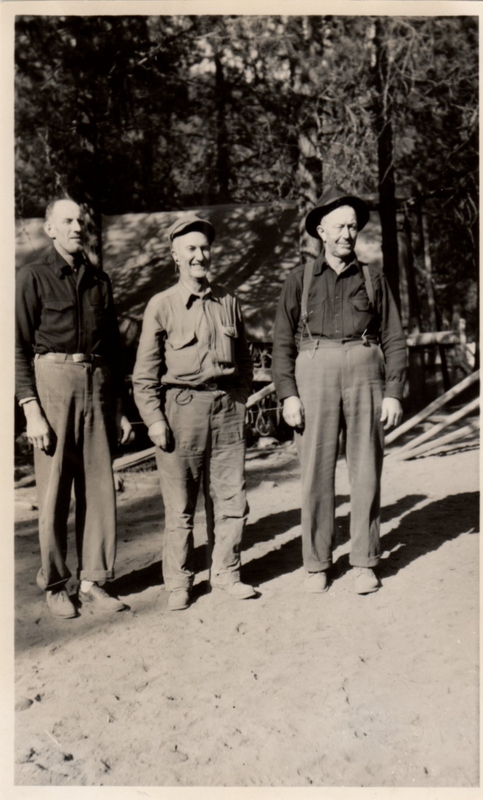 Verne standing with two unknown men. Frank and Lola had the following children: New information see link below. 2. Henry R. Cahan b Jan 1893 in Washington and m. Jessica R. b. 1896 in Illinois. They had Francesco L Cahan b. 1904 in Illinois and Richard Cahan b. 1912 in Montana. 3. Fannie M. Cahan b. August 1893 in Washington. 6. Linnie V. Cahan b. November 1898 in Washington. 8. Madge Cahan b. 1906 in Washington. 10. Faye Cahan b. 1908 in Washington? UPDATE January 7, 2017 – A visitor to this blog has given me a link to Rootsweb family tree that she has been working on regarding the Cahan family. The creator of the Stark Famil website has figured out the children of Frank and Lola Cahan much better than I did so I suggest you go to the link and review her findings. The following photograph was also among Aileen’s possessions. I do not recognize the man and he doesn’t seem to be one of either of the two men in the photograph above. 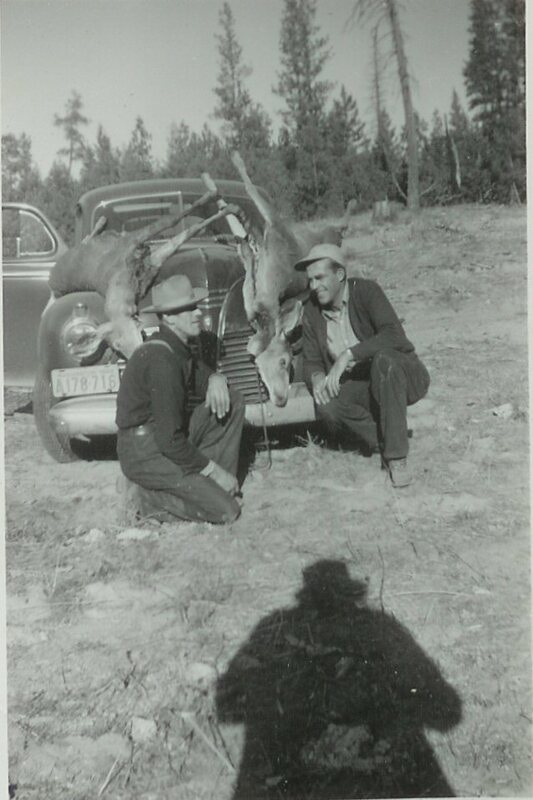 Verne and friend deer hunting. Most of this information on the family of Verne’s came from a U.S. Federal Census study for 1900 where the family was found in Murray Precinct, Shoshone Co., Idaho. The 1910 U.S. Census had them living in Valley Ford Twp., Spokane Co., Washington. The 1920 placed the family in Glasgow City, Valley Co., Montana. The first marriage for Verne must have broken up around 1930 By 1930 most of Verne’s siblings were on their own. Lola the mother appears in the 1930 U.S. Federal Census for Seattle, WA at age 57 but there are no children listed with her. Verne is sitting on the left but the woman is not known to me. A sister? Cahan, Verne C., 138,384 Whit, Residence Mica, WA. Enlisted NG at Walla Walla, WA Aug 2, 1920 6/1. Born in Tekoa, WA, Org: Btry A FA Wash NG (Batry D 146 FA) to disch. Grade PVT. Served Overseas Dec 24, 1917 to June 15, 1919. Hon. disch June 29, 1919. Verne was married first to Rosabel Blanchard b. 1900 in Minnesota on 3 December 1920 in Spokane Co., WA. #29024. County of Spokane: Verne C. Cahan residing at Valleyford, WA age 23 yrs, white, single, born in Washington, occupation Laborer, father: Frank Cahan born in Illinois, mother Lola Feun born in Illin. to Rosabel Blanchard of Glasgow, Montana, age 20 years, white, single, born in Minn. Housekeepr, father Mel Blanchard born in [Maine] mother Mabel Ferguson, born in Ill.?. Married at Spokane, WA on the 3 of Dec 1920. Witnesses Hal J. Cole and [Junnie] C. Cahan signed by S. C. Hyde Justice of the Peace Spokane, WA. They had Melvin Verne Cahan born 13 Aug 1921 and Carol Marie Cahan who may have married a Mr. Brauer. 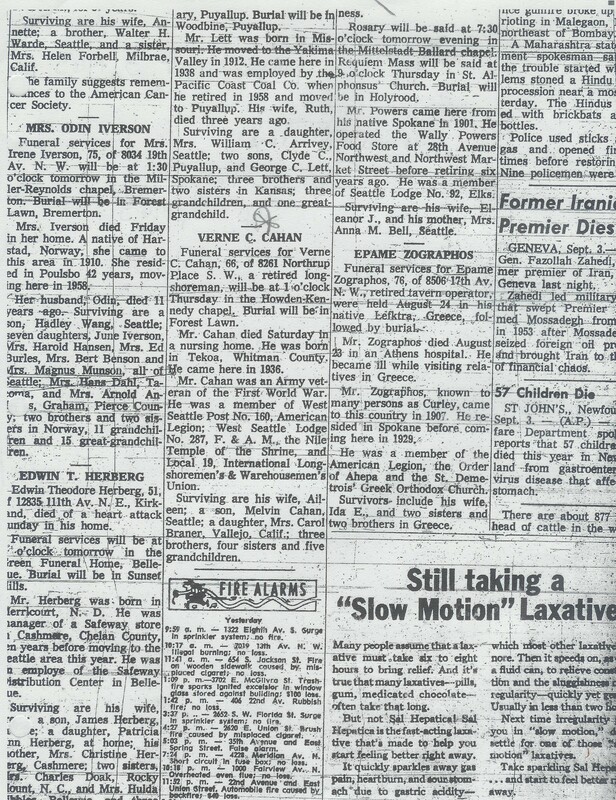 Here is Verne’s obituary notice from the Seattle Times, Tuesday September 3, 1963, pg. 41. Funeral services for Verne C. Cahan, 66, of 8261 Northrup Place S.W., a retired longshoreman, will be at 1 o’clock Thursday in the Howden-Kennedy Chapel. Burial will be in Forest Lawn.  Mr. Cahan died Saturday in a nursing home. He was born in Tekoa, Whitman County. He came here in 1936. Mr. Cahan was an Army veteran of the First World War. He was a member of West Seattle Post No. 160, American Legion; West Seattle Lodge No. 287, F&A. M., the Nile Temple of the Shrine, and Local 19, International Longshoremen’s & Warehousemen’s Union. Surviving are his wife, Aileen; a son, Melvin Cahan, Seattle; a daughter, Mrs. Carol Braner, Vallejo, Calif; three brothers, four sisters and five grandchildren. There is a great deal more research to be done on Verne and his family so please understand that this is just a summary and that all the data here needs to be checked carefully. I am not an expert on the Cahan family. This entry was posted in Aileen Boardman, Cahan surname, King County, Seattle, Washington and tagged Service in WWI, Tekoa, West Seattle, Whitman County WA on January 7, 2014 by BJ MacDonald. Thank you for publishing all this wonderful detail; looking forward to spending some time with it. We never met, but I’m a first cousin once removed to Verne Cahan through his mother’s family (Fenn). K. Lee, I apologize for not answering quickly, we are sick at this house and everything take twice as long to do. This is so cool. I knew Verne only a little because I was a child and he was not really into child, although his son Mel has 5 girls. I do not ever recall having a conversation with him. He talked to others. He helped my brother get work as a longshoreman and he got me into Rainbow with his Masonic membership. Aileen my aunt, mother’s sister, and Verne did not have children. Not sure why, however, I do believe he was in the thick of it in WWI so he had issues. He was good to my Aunt Aileen and she loved him so that means a lot. They lived in a lovely home overlooking Puget Sound off of Lincoln Park in West Seattle. We spent Christmas at their house for years. I did what I could in researching Verne and it is up there on the blog. 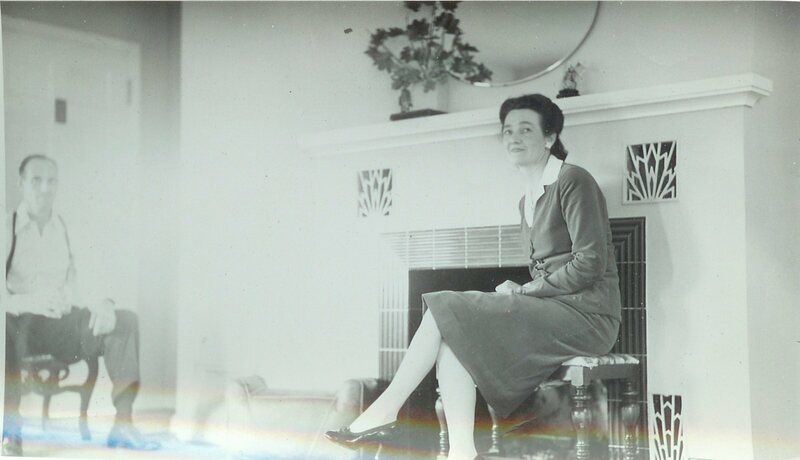 I have about 11 children – Ella F, Henry R., Fannie M., Iona M., Linnie V., Neil, Madge, Ray, Fay and baby Cahan. Leighanna Greshock: Hello Hello Hello…Yes, I remember all of you. Although you were the youngest so I don’t think we interacted that much. I was more Dianna’s age and we had aventures. You are most welcome it is for those who are close to the Boardman family and I know that Aileen, my aunt was devoted to you all. Aileen was my mother Marjorie’s older sister. I would love to connect with you more so I will send you an email. I do have more to share but because of privacy reasons I had to be very careful and even what I did publish is pushing it. This is so cool. Thanks so much for finding me. I am Marjorie’s youngest, Bonnie…She had Robert or Sandy, and Nancy and then me the baby. Although I am not a baby anymore.